Does anyone know of a good source in Boston, or elsewhere in Eastern Massachusetts, for CVNE Riojas? Unfortunately the New Hampshire State Liquor Commission doesn't carry them. I have fond memories of the mid-1970s Gran Reservas. Goodness me, that must have taken some time to put together Tim? Best set of notes anywhere, I`d say. Loved your comments about/referring to the modernists! I have the `03 Riscal lined up for later this month. I have read over the notes here. Is anyone going to give usa good primer on Rioja? What are the grapes allowed besides Tempranillo? How much Tempranillo does the wine have to have? What are the classification systems and what do they mean? What wines do we look fore? What importers? Help out the uninitiated! Wasn't sure what to expect from this wine as it came from the year of the heat. Was it unusually hot in Rioja as well? I'm not sure. Anyway this is dark red, bordering on purple, but it's not at all oversized & the aromas and flavors even show some restraint. Sure there's a good dose of oak, but the fruit is more in the red spectrum, not black or blue, and there's good balance as well. Nice wine. When it comes to Muga, Victor pointed me to their Prado Enea. That particular bottling changed my whole approach to Spanish wines. 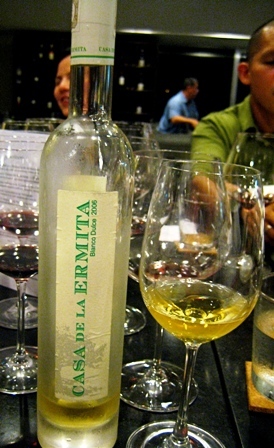 I had the 2000 Prado Enea last night, very attractive wine although I am less fond of American oak than I used to be. Drank it at the excellent Flour and Water in SF, great dinner all around; we also drank Foradori's Teroldego, which was a nice counterpoint to the Rioja. James Roscoe wrote: What are the grapes allowed besides Tempranillo? How much Tempranillo does the wine have to have? What are the classification systems and what do they mean? Lots of grapes. No amount of tempranillo is required: you can make 100% varietals with any of the allowed red varieties, which are tempranillo, garnacha (grenache), graciano, mazuelo (carignane) and maturana tinta. Don't forget that Rioja produces a fair amount of whites too. The permitted varieties there are viura, malvasía riojana (alarije), garnacha blanca (white grenache), maturana blanca, tempranillo blanco, turruntés and the 'foreign' chardonnay, sauvignon blanc and verdejo. In the case of the last three varieties, they may not surpass 49% of a blend. OTOH cabernet sauvignon has been in limbo since a decade ago a small proportion was allowed experimentally. 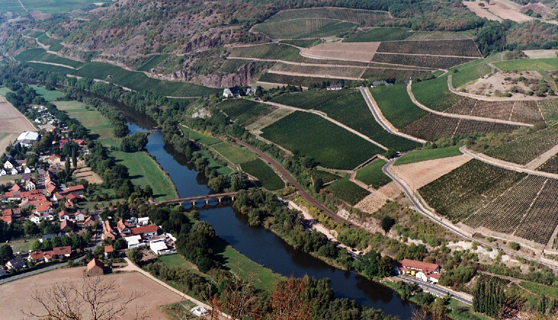 Marqués de Riscal has used it for 150 years, which makes it older in the region than grenache. It's now tolerated in small amounts for those producers who still have some cab vineyards, but may only be referred to as 'others' in a blend. Classification: Strictly based on aging patterns, and ratified by a tasting committee. The back label proves it. Joven: No aging required. 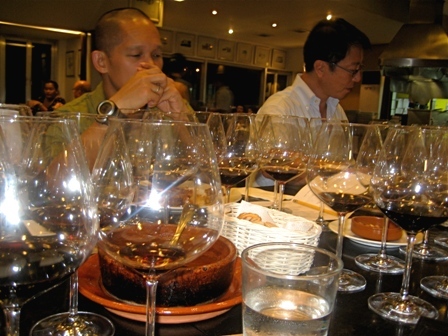 Crianza: A minimum of two years after harvesting before release, of which at least one year in barrel (only 22-liter barrels are allowed), Reserva: A minimum of three years, of which at least one year in barrel. Gran Reserva: A minimum of five years, of which at least two in barrel. For whites, and curiously, the requirement is the same in Crianza and Reserva: two years of which six months in barrel. I guess this means the tasting committee decides if the wine deserves the 'Reserva' or 'Crianza' back label… White Gran Reserva is four years, of which six months in barrel. Many smaller or more modern producers bypass this strict system and just use the basic 'Joven' back label, which frees them to age the wines as they see fit. Thanks Victor. One little (I hope) typo: 22 liter barrels? I presume you meant 225 liter barrels? Of course - the 5 disappeared somewhere. It's a strange rule - not even 228-l Burgundy 'pièces' are theoretically accepted, and even less so the 300, 400 and 500 l barrels many current producers favor to reduce oak contact. I wonder if this rule is very strictly enforced. Last edited by Victor de la Serna on Wed Jan 06, 2010 7:46 pm, edited 1 time in total. Excellent! Thank you as well. How many of these "rules" carry over into other regions of Spain? Bob Parsons Alberta. wrote: Goodness me, that must have taken some time to put together Tim? Best set of notes anywhere, I`d say. Loved your comments about/referring to the modernists! Is that the Riscal Reserva Bob? If so, I predict that you are going to like it a LOT. The Riscal Reserva from the mid 60's is the wine that got me into enjoying wine. I was a young (maybe not so young?) airman who the USAF decided needed to experience Spain, and I did that with great enjoyment. I truly wish I could find a way to go back. Yes Bob, Reserva! I think I posted on the `01 here last year. This wine is readily available up here in Alberta, plus the Rueda. Monte Real was my first intro to Spain and I still have my notes somewhere here in the den! Great info from Victor eh? Well-written notes. I've had the 2004 Riscal Reserva a couple of times recently and I enjoyed it but something about it made me edgy. It feels like a classic Rioja but something is missing and it doesn't inspire enough confidence that it will ever find that missing piece. I think the Big Three (Muga, La Rioja Alta and Ygay) have spoiled me too much over the years. 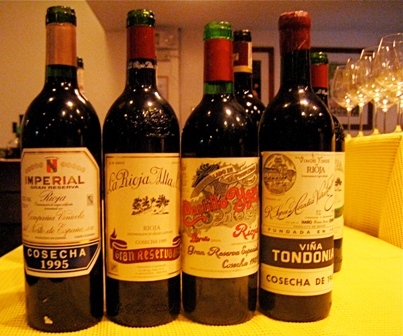 The Rioja aging regulations apply, sometimes with slight variations, in most Spanish appellations. But they are largely followed in Rioja and Ribera del Duero only - in most other places the producers don't like this idea of 'quality' being directly related to 'aging before releasing'. Re Marqués de Riscal: their basic wine today is the Reserva (they make no Crianza), of which they produce a whopping 400,000+ cases a year. It's a good QPR Rioja (very nice price indeed), but not a top-shelf one - it could never be with such production numbers. If you want to taste classic Marqués de Riscal today, it has to be the Gran Reserva. Indeed, as mentioned in another thread, the 2001 is one of my newspaper's three Wines of the Year for 2009. Thanks for the great info Victor! Besides regulating barrel size do the wine produces experiment with various coopered barrels, or do they stick mainly to French and American oak? I have reported on this wine in the past, but thought I would pop another bottle & post another note. After some time in the cellar I like the way this wine has further integrated, and while it still shows some of that "sappy" oak character there is less than a while back, and the dry cherry fruit and leathery aspects of the wine are even more apparent. It's a lovely food wine, and not so austere that it cannot be enjoyed on its own (he types as he takes the last sip from his glass). WTN: `01 Bodegas Franco-Espanolas Rioja Bordon Gran Reserva. 80% Tempranillo, 13.5% alc, $28 Cdn, not decanted. Traditional house, not too well-known over here I believe? Color. Translucent ruby red, some slight orange shows on rim. Nose. Has some initial barnyard funk, cherry, after 2hrs some mocha and brambly. Not too distinct though. Palate. Entry thoughts are still tannic, dry, good acidity. "Past its peak" from across the table but I say "hang on". Firm grip from the tannins and a lengthy cherry finish after an hour. Medium bodied and developes some sweetness with roast pork shoulder. Not top-notch, took some time to open up, old school in my book. Wonder where I go from here? Victorwine wrote: Besides regulating barrel size do the wine produces experiment with various coopered barrels, or do they stick mainly to French and American oak? The much less expensive American oak remains prevalent, but as long as it's oak (no chestnut or acacia allowed...) it's legal. Slavonian, Hungarian, Romanian, Russian... Even some Spanish oak now. This wine nce again impresses me as being caught half way between classical and modern Rioja. Which is not a bad place to be, actually. Despite being raised in French barriques, the nose is very Spanish, if not outright Rioja, lovely in its red fruit and hints of saddle leather. The medium-bodied palate is even better, with good acidity and savoury tannins playing against a raspberry sweetness. Had the 1999 Pecina reserva a few weeks ago. Good bottle of wine, nice balance, might even do better with another couple of years age. Has that "dusty" american oak flavor as a component not as the leading flavor. Someone said at the time I should look for the 98 Gran Reserva of this wine. I'm not sure if I posted this before. Please excuse me if I have. From a little less than 4 months ago. 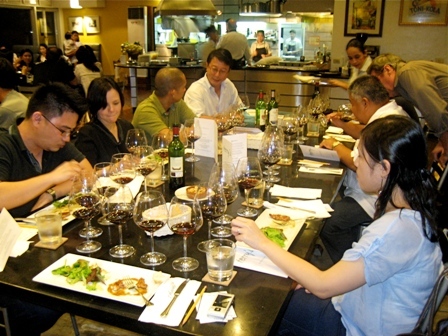 Last night, 18th September 2009, was a night featuring mostly aged wines from Rioja. 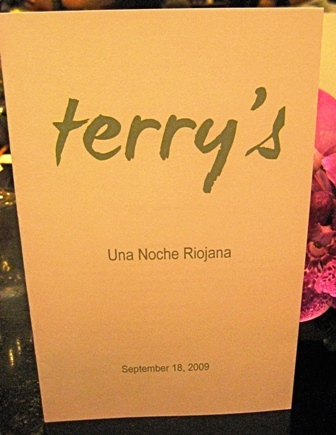 good friend and chef/oenology Phd/former concert pianist, Juan Carlos "JC" de Terry, graciously agreed to create and execute our pairing menu. 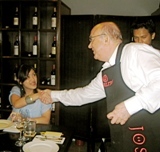 With JC's unparalleled mastery and depth in Spanish wines and cuisine, combined with his innate artistry, intellect and sensitivity, there is nobody better in the Philippines to create the dishes for this momentous tasting. We were 9 persons in all. Because we were also to have some white wine, rosado and sweet wine as well, JC prudently advised that we may have too many reds that night, so we elected to keep the 1998 Ygay GRE and 1995 Campillo GR as back-up bottles, to be opened only in case of "emergency" - so that left us with a more manageable number of 8 different reds (broken up into 2 flights of older and younger wines) with the meat course. We gathered on the appointed date and venue, several a bit late due to Friday night traffic, so we took the opportunity to catch up with each other over some 2007 Marqués de Cáceres Rioja Blanco and toasted almonds until we were complete. Though incredibly busy, JC took the time to come out of the kitchen (2º Piso was jam-packed that night) to meet and greet everyone. I told him everyone was so excited for this dinner ever since he agreed to make our menu. I, personally, barely slept the night before from all the excitement. When Johnny R arrived, we got down to business. 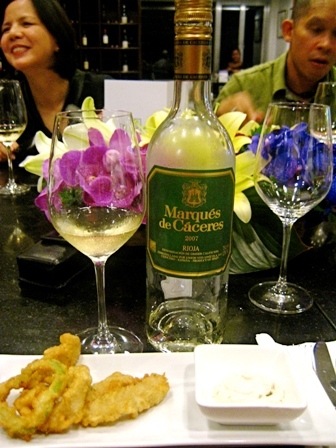 2007 Marqués de Cáceres Blanco - a 100% viura from Rioja keeping in line with the evening's theme. Very fresh, light, dry with a touch of white florality and bright, moderate acidity and an appetizing bitterish almond finish (which is why it is usually taken as an apéritif with toasted almonds in northern Spain). 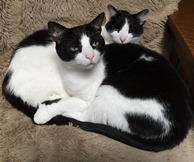 That it was an excellent match was not surprising as the blanco brightened the tuna belly, which, itself, had been marinated in the very same wine. An interesting aside was that this spin on tempura still held to a general Spanish theme because, though widely thought of as a Japanese dish, as JC astutely pointed out during our planning session, tempura was actually introduced into Japan by Spanish and Portugese missionaries and explorers (See: The History and Culture of Japanese Food, Naomichi Ishige [Kegan Paul: London] 2001; p. 246). With this typical, refreshing and very easy to drink white, we continued with the next dish. This was probably the biggest and fattest local oyster I have ever eaten. This was also the most complex yet delicate rendition of oysters baked in cream and cheese as well. The dish's title belies the many steps in its preparation and doesn't even mention the parmesan, etc. used in making the bechamel base. JC did tell us exactly how it was made, but, with due respect, I could not divulge the recipe. Take it from me, though, it was exquisite and all in perfect balance - the cream and cheeses subtle and never over-powering the shellfish. 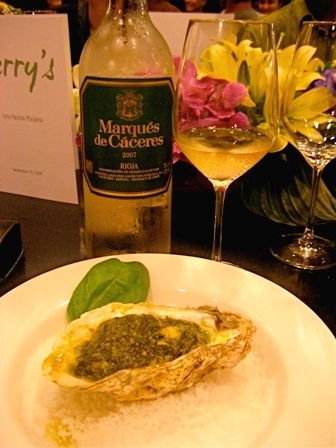 In addition, the wine's brightness and crisp acidity gave lift to the delicately creamy oyster. The progression then eased gently into slightly heavier and spicy fare - towards the final transition to the meat and featured reds. 2007 Protos Rosado - Fresh, well-balanced, straightforward, honest, fruity rosé - a bit high in alcohol content for a rosé, but only apparent on the label and the nice rounded heft mid-palate. Good extraction (I never thought of a rosé as well-extracted, but there you go). Fun to drink - strawberry/cherry/raspberry (in descending order) with a faint red beet nuance underneath. 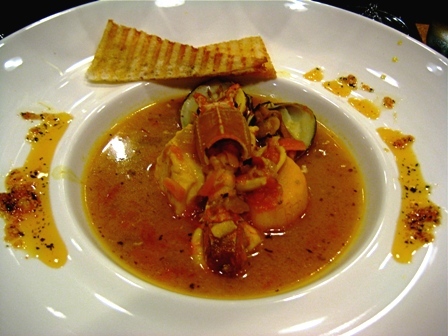 Its magic, though, was in the pairing with the richly and complexly flavored crab/shrimp/grouper bisque. Absolutely wonderful match - difficult to describe - the freshness of the fruit cut the richness where needed and cleansed at the finish, while the rounded middle fruitiness added nice weight and "meatiness" to it mid-palate. Bravo! My and my wife's favorite pairing of the evening. Now, the rosado showed off surprising depth, plus, I may add, a more savory than fruity character and firmer, more serious structure compared to over a year ago. There was also a faint blackcurrant nuance underpinning the red berry/fruit that I did not detect before. This is a tempranillo rosado from the Ribera del Duero, not the Rioja. I recall there was no Riojan rosado available, but I could be mistaken. In any event, I cannot imagine another rosado that could have paired better than this and with the following two dishes. This was another particularly memorable dish - not only because of its rustically elegant presentation, but because of its graceful power as well. Though the body of the dish was robust, the escargot flavors were delicately balanced with the earthiness of lard-enriched (as Johnny immediately noted) mashed potatoes, accented with a bit of crisped ham. With the sturdy, masculine rosado, I felt like a cazador tucking into a hearty meal, my trusty hunting dogs and emptied escopeta at my feet (a flawed image at best, since my dogs are, in real life, a lazy, overweight labrador and a quirky, terribly spoiled dachshund, and one hardly needs a shotgun to hunt down snails). Be it as it may, this dish was obviously a hit with the group - just look at Miguel below inhaling those hot snails as Keiichi wonders "...and where are mine?" Symphony of Crustaceans and Rosé from Peñafiel, or, "The Quintessential Mediterranean Seafood Soup"
Each shellfish was perfectly cooked - not a single one saw a second more heat than needed. The soup itself was created entirely separately, obviating the need for the main ingredients to remain long therein to flavor it. I loved that JC used the now nicely fat mantis shrimp (a.k.a., squilla mantis, galera and, locally, alupihan dagat) that were thoughtfully already shelled when plated. Heavenly. 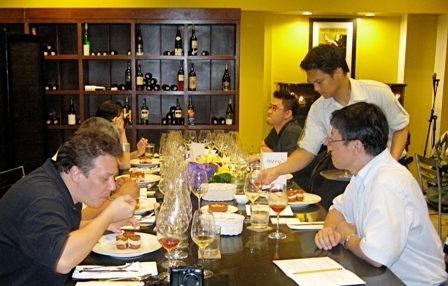 That the same rosado as the pairing wine was used in making the soup is a typical touch that one expects from JC. I noted that the Stockbroker, Keiichi and Johnny, among others, gladly had an extra serving of the soup when offered. Johnny (who is an accomplished cook when not taping for a tele-novela) noted that the saffron notes just whispered. Aaron asked JC if this dish was on the menu so he could have it again soon. Much to his and everyone else's sadness, this (as well as all our other dishes that night) is not on the menu - being specially created for our dinner. 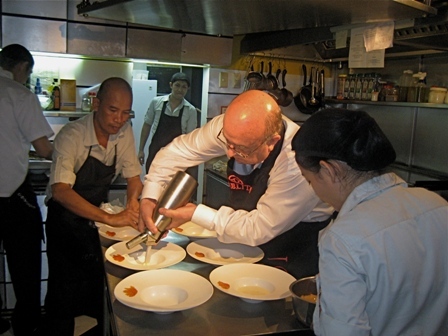 JC, artist that he is, does not normally re-execute such special dishes...but we can always hope. In the meantime, during the brief breaks before main courses, the Stockbroker and Johnny had opened the older bottles of red to breathe as JC was way too busy and the waitstaff was too nervous to open them themselves for fear of crumbling old corks. Thankfully, only one of the older wines, the 1985 Lopez de Heredia La Tondonia Gran Reserva, needed the Stockbroker's Wine-911 rescue skills as the cork broke in half, and then broke again, leaving barely a fifth still in the bottle. The Stockbroker, however, was able to finesse that last fifth out without anything falling into the wine. That's a real talent, he has, I tell you. This was accompanied by a greens and arugula salad dressed with 40-year old balsamic vinegar. 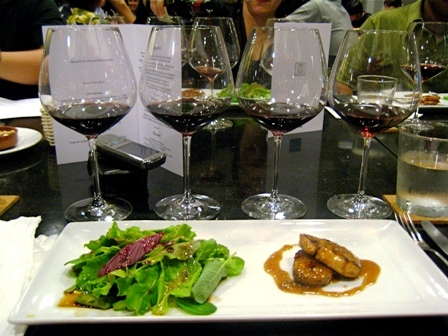 Though initial tasting portions of the 1st flight of reds had already been poured (more was, of course, available for us to pick and choose more proper pours of), I followed Johnny's quick lead in holding off tasting them until after this lightly piquant fish and salad course. I did think of continuing with the rosado, but felt I'd better slow down as more reds were on the way plus the dessert wine. I was also hoping to be sober enough to have a glass or two of pacharán after dinner as well. ...I had the reds. 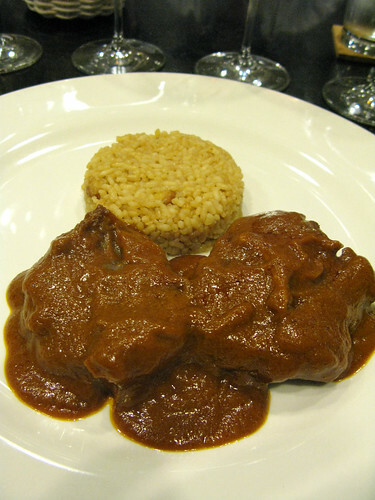 This was an ideal dish to have with all the reds as it was a typical Spanish dish the original house sauce of which JC changed as the latter was, per he, "more Andalucian than Riojan". 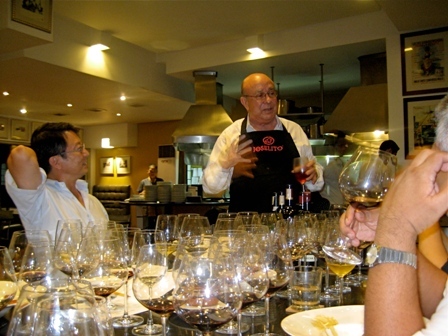 Miguel elaborated to the group that chilindrón is "a tomato based sauce, different kids of peppers, wine and a lot of tiny bits of Jamon Serrano that eventually melt into the sauce which is typical from the Rioja/Aragon/Navarra (regions)." JC also tweaked the sauce by using, I believe, some of Alvaro Palacios' Rioja tinto joven, Remondo La Vendimia (I don't recall the vintage). I've not tried it yet, but J-Lab has and told me that he considers it a great value Rioja at around P750-P800/bottle from Terry Selection. I noted that the accompanying pilaf was particularly fluffy with a nice, earthy nuttiness from scattered fried chickpeas. I asked JC what kind of rice he used (all I could tell was it was a short-grained rice) and he replied that it was Bomba rice, a special kind grown in Valencia - I believe this was from the town of Calasparra. My notes shall be abbreviated as the wines are all Riojan and primarily tempranillo-based; thus, they share dominant scent/flavor profiles such as, among others, strawberry, cherry, raspberry, violets, cedar, leather (especially the older ones), licorice, oak/vanilla (many use a mix of American and French oak, but more American, of various cycles and levels of toast), etc. Rather than repeat myself over and over, I noted the marked differences between the wines. 1985 Lopez de Heredia La Tondonia Gran Reserva - Miguel's bottle, one he brought in from Spain specifically for this dinner. Comparatively the leanest and lightest in body of the line-up. Very pure and clean, sweetish, sherry-like nuance to its cherry and strawberry, cedar, mild underlying dark berries, hint of dried plum, whispers of leather and old, pressed violets. Admirable complexity, though without much of a middle; no real crescendo, though the flavors are definitive. I would sip this wine rather than pairing it with the rabo de toro. 1985 Marqués de Murrieta Castillo Ygay Gran Reserva Especial - the Stockbroker's bottle. Lush, a notch or two under full-bodied, comfortingly warm with concentrated, softly ripe fruit laced with slight leather, sweetish pipe tobacco, licorice, cinammon and clove whispers and mildly toasty/creamy oak. Acidity is a bit low. Long sweetish cherry/raspberry and violet finish. Notably old school in use of American oak (I suspect there was more new oak exposure than all the others, but I could be wrong). Very old-style Rioja with, as noted by JC, good typicity, elegance and harmony. No need to to worry about this lasting several more years. 1989 Rioja Alta Gran Reserva 890 - My bottle (many thanks to Spanish wine journalist and winemaker, Victor de la Serna, for his service advice on this wine and to Miguel who brought it in for me from Spain). This needed some time in the glass to blossom. When it did, it displayed sweeter cedar and violets in its bouquet and more consistency. Firm structure, notably neat and well-focused flavors. Smooth, light-silken on the palate with more violets and cedar, slight underlying leather and tobacco. Medium finish with tartish cherry, cedar, leather and violets lagging behind. I'd say fully mature at this point, judging from this bottle. 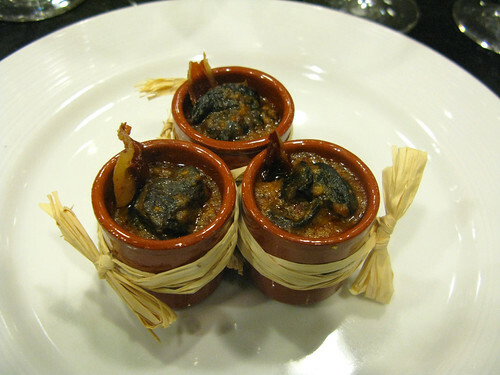 J-Lab opined that it paired best with the rabo de toro. 1995 C.V.N.E. Imperial Gran Reserva - J-Lab's bottle. This, like the 890, needed time in the glass to show its true charms. Richer, broader, more pronounced middle than the rest of the first flight wines. Full-bodied, a bit chunky in mouthfeel especially after the Rioja Alta 890. Soft, ripe fruit, slightly less oak than the '85 Ygay GRE, hint of dense balsamico. This has many years under its belt. 1997 Rioja Alta Gran Reserva 904 - Aaron's bottle. Healthy, rich, ripe, dense fruit with cherry and sweetish raspberry leading the way. There is a notable dark minerality as well. Good push/drive and heft on the palate but puts on the brakes at medium point on the finish. J-Lab commented to me that he also found the finish a bit abrupt. Pure and clean, showing off its sturdy structure and well focused, mildly spicy, dominant cherry and strawberry notes with style and panache. Underneath, there is some dark fruit and the wine is highlighted by nuances of violets and a bit of cedar. This is much brighter in character than the 2001 Reserva and lighter as well, but with much nimbler feet, much better in purity and infinitely better integrated wood. It dances on the palate. Very nice indeed, with comforting typicity to boot. Though with undoubtedly firm structure, the wine's light touch did not overpower the scallops, the fricasée of spring vegetables lending a bit of earthiness and body to the shellfish which helped the pairing work as well with the next, slightly heftier seafood dish of Olive Oil Poached Bacalao with Vierge Sauce. Comparatively leaner, edgier, more vibrant fruit and with good focus. I, personally, like this style. This projects itself very youthfully, but already very enjoyable. This seemed quite ready to drink at this point, and, if I were asked to sum up this wine in a single word, I would have to say that it is a "correct" wine: good typicity, precise balance of fruit, wood and acidity. The base flavor is dark berry/fruit, with topnotes of strawberry, Spanish cedar and a hint of mint. There is also a discreet, underlying tobacco leaf nuance to the dark fruit base and a general, but well-integrated, spicy woodiness to this as a whole. There are no fireworks or parade to see here; rather, a readily pleasing, competent and correct Rioja reserva. 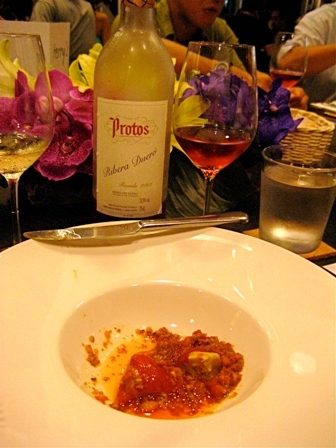 Keiichi favored this wine as a pairing with the rabo de toro. 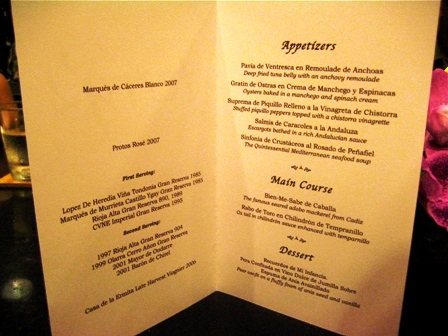 2001 Marqués de Riscal Barón de Chirel - Keiichi's bottle. I learned about this top-end bottling of Marqués de Riscal from a list of Victor de la Serna's recommendations in one of the three US wine bulletin boards I participate in. Youthful, full-bodied, broad, commanding presence on the palate - it certainly made me sit up and take notice. I concur with J-Lab's observations of fig and plum notes, as well as Aaron's of leather and cigar (I would specify Cuban, particularly like some of the dried fruit and chocolate noted Romeo y Julieta Exhibicion No. 4, a nice hermoso I used to smoke a lot of in the late '90s). I add to those blackcurrant and cherry with a dose of underlying black coffee. This, like the '89 Rioja Alta GR 890 and '95 CVNE Imperial GR, needed time in the glass to show its considerable charms. I woulde certainly like to re-try this, say, 5 years from now (to see how it comes along) and every year thereafter. The main courses and most of the glasses of reds done, we moved onto dessert. Another stunning dessert from JC. I've written before that he has the heart of a chef and the soul of a pâtissier as his special desserts are always so complex, intellectual, yet so sinfully delicious and indulgent. What the description above fails to mention is that the espuma has in it essence of orange blossoms. 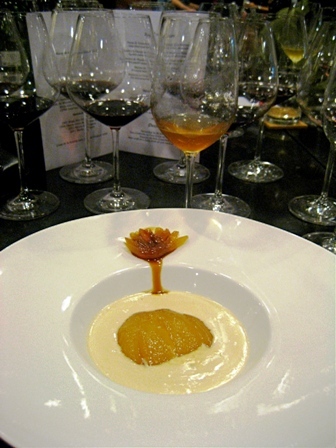 The spare confit liquid he used was hit with a bit of vodka and appears in a glass in the picture immediately above. I sipped a bit and dribbled a little into the foam. From an increasingly appreciated (Jancis Robinson notes them for making bright, new alternatives to Sauternes) ten year old winery, this wine is made up of viognier grapes from the Jumilla D.O., late harvested, and, per JC, sunned on mats to concentrate the sugars. This brightly sweet, but not cloying, wine presented dominant floral, super-ripe, honeyed cling peach and a slight undertone of sweet kumquat. Well concentrated but fresh and light on its feet, it cut the foie's richness nicely and cleansed the palate between bites - the melba toast added needed textural contrast. Tastes like some of those sweet viogniers I tried in France last June 2007, but more concentrated and rounder on the palate. This brought an end to the meal proper, leaving us to finish off what little reds were left and discuss the wines. No voting was done as the reds were not served blind. Jorge Ordonez selection or import. I don't remember when this was purchased or what I paid for it. Deeply colored--dark opaque purple. Nose suggests dark fruits and leather. Dark berry flavors coincide with soft tannins. There is also a slight savory note. It's approachable now but I'm unqualified to say how long it will live or whether it will improve. I find it pleasing now and would not be tempted to lay it down for a long time. From past tastings, I prefer Muga that is not heavily oaked and this is in the light oak category. JC - the Muga Selection Especial runs $35-$40 in my market. I loved the '96, but have found the 2004 overoaked to my taste. Whether that is me or the stage when I tasted the wine (mid-'08) I am not sure. My last bottle of hte '96 was delicious last year, so medium term cellaring may be quite possible. Thanks David for your comments. I will be opening a couple more Spanish wines this month. My brother-in-law served this wine (decanted for 2 hours and blind) for Christmas dinner with rack of lamb and oven-roasted potatoes. I usually drink good, classically-styled, low/medium-priced ($20-50) Bordeaux with rack of lamb (I call it my "mint-jelly"). At $9.99/bottle, this was a very pleasant surprise! A lovely wine: I guessed the wine to be a very nice Bordeaux Superieur, but should have been (?) tipped off by the slightly lighter, ruby color with orange at the edge; in defense of myself, I didn't know anything about the wine or its age. The wine had a bright, crisp, sour-cherry smell and a medium body, with sapid flavor & dusty tannins & a long, palate-cleansing finish with a hint of sweetness in the back of the throat as it said good-bye. After finishing the decanted wine, we uncorked another two bottles to decant; immediately upon opening, this Rioja Crianza reveals a sort of old-world sourness which results from time spent in larger, used barrels (my guess) but with about 1/2 hour of air, the sweetness (i.e. sour cherry) emerges in the nose, and the wine fills out nicely. A really nice bottle for $9.99 and great with the lamb. Lopez de Heredia Vina Tondonia Reserva 1999 - I've had Tondonias a couple of times before and it's just a style I don't get. Maybe it's too old-fashioned for me. I've changed my mind with this bottle. A light wine but with a surprisingly firm finish. Very elegant and understated. Some tea notes mingle with the very gentle sweetness of the fruit. Real easy to drink. Excellent. Maybe I should just avoid the Gran Reservas of this house and go for the Reservas. Victor says not to give up on the Gran Reservas and go for the current 1991 release. I'll try that as soon as I can.